Do Chinese people care about climate change? China has had an eventful summer marked by record-setting heatwaves, deadly flash floods, and typhoons. The impacts of climate change have been felt in cities and the countryside alike, and seem to have triggered greater public interest in discussing climate change. But will this outburst of curiosity be short-lived? In other words, do Chinese people really care about climate change? Yes, they do. As the government tries to position itself as an international leader in responding to global warming, recent surveys show that the public supports the government’s actions. A reassuring 94.4% of respondents to a national survey in 2017 said that climate change is happening, and 66% believe it is mostly caused by human activities. Two separate surveys on this topic, one carried out by the China Centre for Climate Change Communication (China 4C) in 2017, and the other by the Innovative Green Development Program (iGDP) in 2018, show that Chinese attitudes to climate change are being driven by high-profile government-led campaigns and public concern about air pollution. A series of national policies and campaigns have been launched in China to decouple economic growth from greenhouse gas emissions. This began after the 2009 Copenhagen climate summit, when hope of a binding international climate regime was dashed, and domestic environmental issues such as air pollution became more pressing. Government-led campaigns to promote energy conservation and low-carbon development and lifestyles have been widely publicised in the media. As has the role that China played in forging the Paris Climate Agreement in 2015 – this was a highly acclaimed political event back home. So it is not surprising that when asked who should play a greater role in tackling climate change, respondents to the iGDP survey overwhelmingly said that it should be the government. On a scale of 1 to 5, government received 4.11, followed by the media, environmental groups, individuals and enterprises. This mindset has also secured public support for the government to limit greenhouse gas emissions (97%), and remain in the Paris Agreement (94%), according to iGDP. However, when analysing these responses there is an important caveat: the public might not fully understand exactly what they’re being asked. Jia Hepeng, former editor-in-chief of Science News, pointed out, for example, that people might have difficulty differentiating carbon reduction targets from carbon intensity targets (the latter being the amount of carbon emitted per unit of gross domestic product). The policies can have radically different socio-economic impacts. The iGDP survey of public perceptions on low-carbon cities appears to bear out this common misunderstanding: while 83% of respondents say they “know about” the concept of going low-carbon, only 29% are confident enough to say they “know very well” about it. 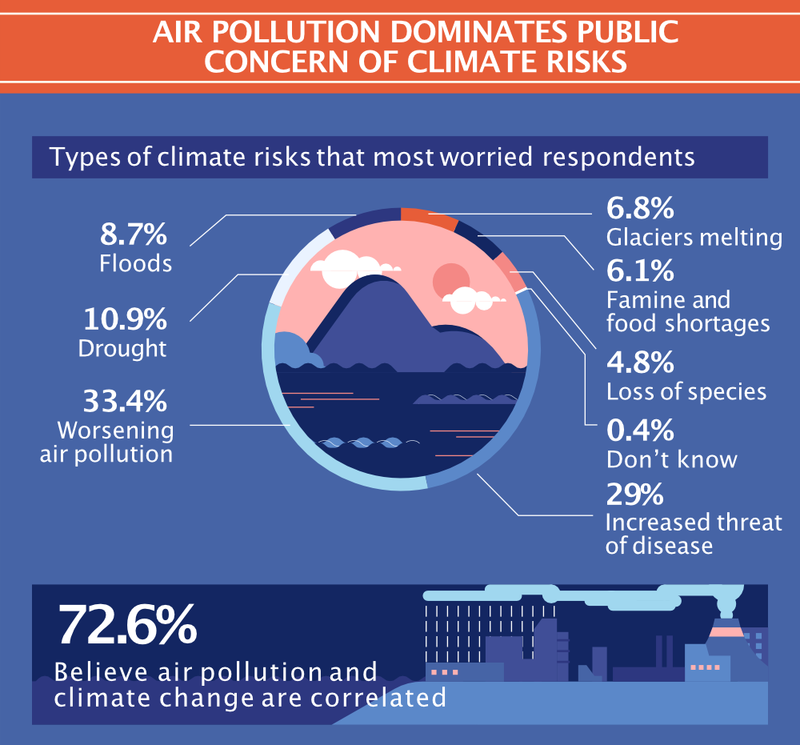 Climate change is closely linked with air pollution in the public’s eye, with 72.6% of respondents saying the two issues are connected, according to the China 4C survey. Respondents also said that worsening air quality is the climate risk they are most worried about, followed by increased risk of disease, drought, flooding, glacier melt, famine and food shortages. This perception might come from the public’s awareness of China’s dependence on coal as a primary source of energy, and heightened concern about the health risks associated with air pollution. In the iGDP survey, air quality is also viewed as the most important aspect of a city’s low-carbon development, compared to public transportation, water consumption levels and its handling of waste. Residents in bigger cities such as Beijing and Guangzhou are the least content with the status quo. 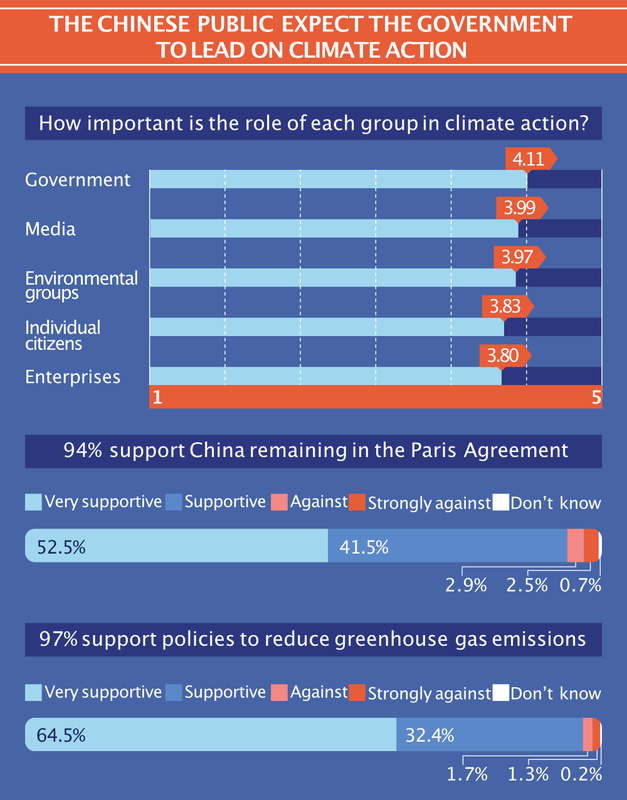 The iGDP survey also asked Chinese interviewees to rank actions they were most likely to take to address climate change. 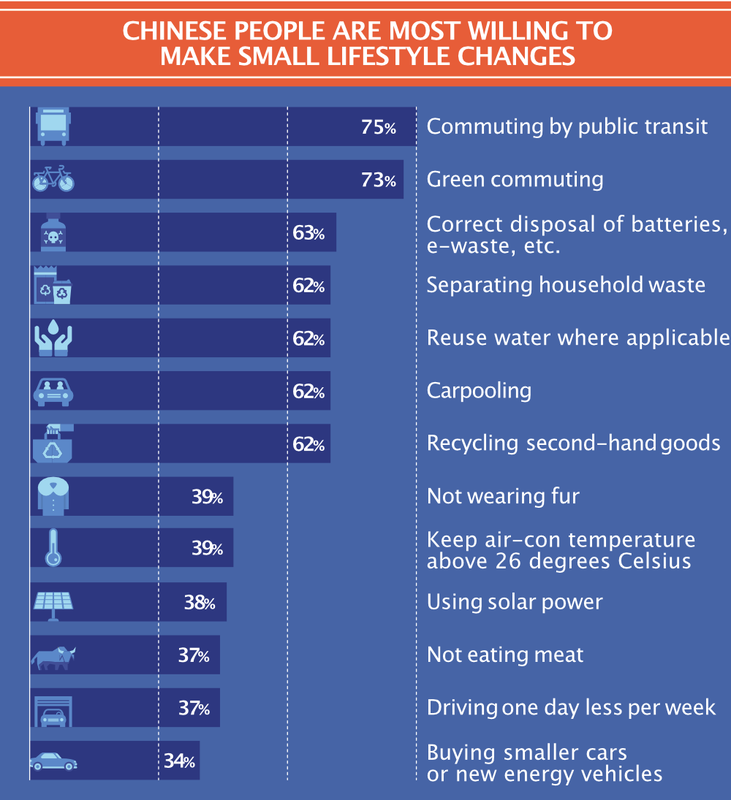 While the Chinese public are receptive to easy steps such as commuting with public transportation and garbage sorting, more substantial changes to behaviour, such as buying low-emission cars and making dietary changes, are perceived with much less enthusiasm. 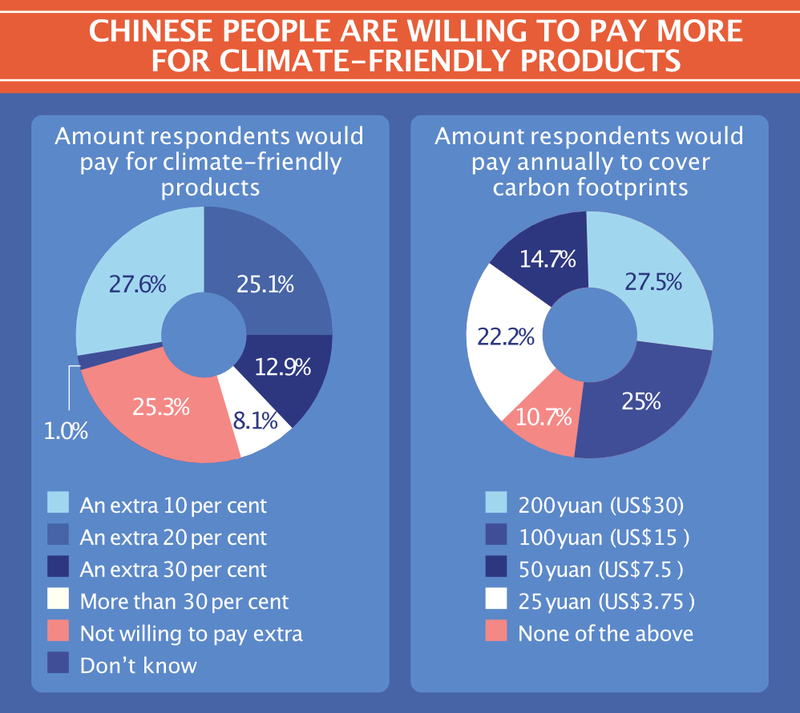 But when it comes to making a difference with their wallets, the Chinese public is open to spending money to offset carbon emissions, with over half of respondents willing to spend more than 100 yuan (US$15) annually to do so. This is in line with previous polling results that found urban Chinese consumers willing to pay more for electricity from renewable sources, implying space for low-carbon initiatives that harness the rising purchasing power of Chinese consumers. 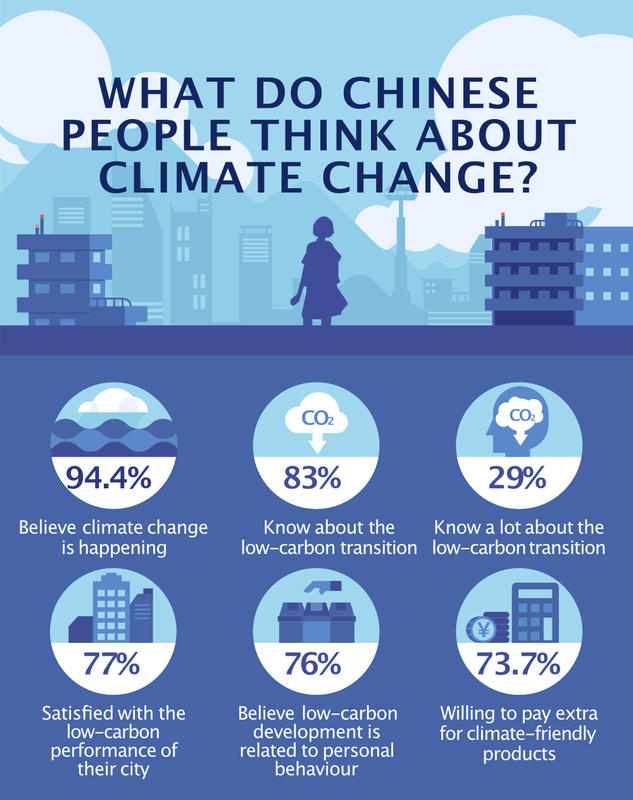 The Climate Change in the Chinese Mind 2017 survey was conducted by the China Centre for Climate Change Communication (China 4C) with a computer-assisted telephone survey in 2017. A total of 4025 people, aged between 18 to 70, were surveyed via mobile phone (84.6%) and landline (15.4%). The respondents were from 336 Chinese cities. Survey of Public Perceptions on Low-Carbon Cities was conducted by Innovative Green Development Program (iGDP), a Chinese think tank, in 2018 as part of its research on China’s Low-Carbon & Green Index for Cities (LOGIC). LOGIC rated 115 Chinese cities on their performance. A total of 2,000 residents from 20 cities with the highest LOGIC rating were selected for the survey. Respondents aged between 18 and 55 were surveyed online, while the rest aged between 56 and 70 were interviewed offline. This article was first published by chinadialogue.net.